The research in my laboratory focuses on mechanisms of chromosome segregation in meiosis. Meiosis is the special cell division that generates haploid sperm or eggs as part of the sexual reproductive cycle. We are primarily interested in how the chromosomes pair with each other to enable them to be sorted in a reliable manner. If these pairing processes go wrong, sperm or eggs can wind up with the wrong number of chromosomes. This leads to aneuploidy and spontaneous abortion or birth defects. We work with the fruit fly Drosophila melanogaster. This small insect is easy and cheap to culture, has a short generation time and meiotic chromosomes that are easy to access and study. In addition there are a large number of advanced genetic tools that facilitate identification and analysis of genetic control of chromosome segregation. In recent years our work has focused on two pairs of genes that pair chromosomes in different ways. We discovered these genes by identifying mutations that cause very high levels of chromosome segregation errors and aneuploidy. One pair of genes, sisters on the loose (solo) and sisters unbound (sun) encode proteins required to maintain sister chromatid cohesion throughout meiosis. These proteins interact with the cohesin complex and are required for cohesin to localize to centromeres. In solo or sun mutants, sister chromatids become disconnected early in meiosis and segregate randomly. solo and sun are also required for crossing-over between homologs and for stability of the synaptonemal complex, an elaborate structure that forms between homologs and facilitates crossing-over. 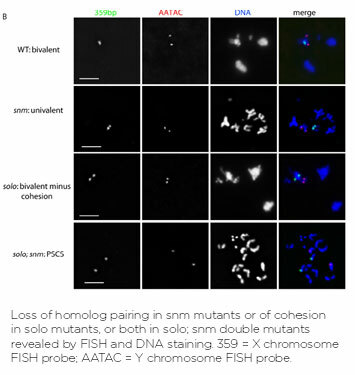 The second group of genes, stromalin in meiosis (snm) and mod(mdg4) in meiosis (mnm) encode proteins that co-localize to homolog pairing sites in male meiosis and are jointly required for stable homolog connections. In mutants for either gene, homologs become disconnected and segregate randomly. Understanding how these unique complexes function to orchestrate chromosome segregation is the major current challenge in our laboratory. McKee BD, Karpen GH (1990). Drosophila ribosomal RNA genes function as an X-Y meiotic pairing site. Cell 61: 61-72. PMID: 2156630. Thomas SE, Soltani-Bejnood M, Roth P, Dorn R, Logsdon J, McKee BD (2005). Identification of two proteins required for conjunction and regular segregation of achiasmate homologs in Drosophila male meiosis. Cell 123: 555-568. PMID: 16286005. Yan R, Thomas SE, Tsai J-H, Yamada Y, McKee BD (2010). SOLO: a meiotic protein required for centromere cohesion, coorientation, and SMC1 localization in Drosophila. Journal of Cell Biology 188: 335-349. PMCID: PMC2819681. Tsai JH, Yan R, McKee BD (2011). Homolog pairing and sister chromatid cohesion in heterochromatin in Drosophila male meiosis I. Chromosoma 120:335-351. PMID: 21384262. 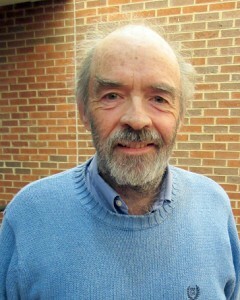 Tsai JH, McKee BD (2011). Homologous pairing and the role of pairing centers in meiosis. Journal of Cell Science 124:1955-1963. PMID: 21625006.